So here's our first watermelon. There are two of them growing right now. This thing is TINY! We're talking about the size of my thumbnail...see how big the blades of grass look? Our garden is doing well, although the lack of rain has made it a struggle. Yesterday afternoon and overnight last night we received our first rainfall here since April 4th. As the heat has really turned up, we are also seeing signs of heat stress on our pumpkins and cucumbers. I'll take more pictures of the garden this weekend before I head out to Nebraska for more AF Reserve work. *Yes, this is one of the much-less-creative blog post titles. I have an awesome watch. I've had this watch since my college graduation in 1995. It was a gift from my parents...16 years ago this week. Yep, that's a now-extinct Nittany Lion statue in the middle of the dial. Being that it's a Seiko, it has performed incredibly for the past 16 years. About 2 weeks ago, the watch stopped. This has happened before, and all that means is a new battery. I typically have to change the battery out every 18 months. I took it to the mall to replace the battery, but the watch didn't resume working right away. It played dead for a day or so, then started working. I wore it for a couple days and all seemed well; then I wore the watch when I took a run last week and it stopped again. Probably from my sweaty arms (ewwww!). Back to the jewelry kiosk at the mall. The gentleman there told me that the watch needs to go to a Seiko authorized repair facility to replace some of the contacts that had gone bad. So it will operate intermittently until I get it dealt with. So I will put the watch in the mail (adequately insured, I promise!) this week. Yeah, it's gaudy, but I wanted to have a little fun. Pink. I was looking for a watch for running and this model had everything I was looking for. I had a choice between purple, blue, orange and pink. The blue was a very bright blue, as bold as this pink here. Being that I have some AF Reserve drill days next week and chances are my Seiko won't be done by then, I'll need to think twice before putting on this new watch with my uniform. Since it's supposed to be conservative. We moved here in November, and by then most of the growing season was over. So we've been greeted with all sorts of surprises over the past several weeks. I've been taking lots of pictures of the pretty flowers blooming around here. Unfortunately, these past few days all my photography has been with my iPhone camera, which is pretty good quality (for a smartphone camera)...but doesn't give me the same flexibility as our Canon. Dave had taken the Canon to Pennsylvania last weekend. 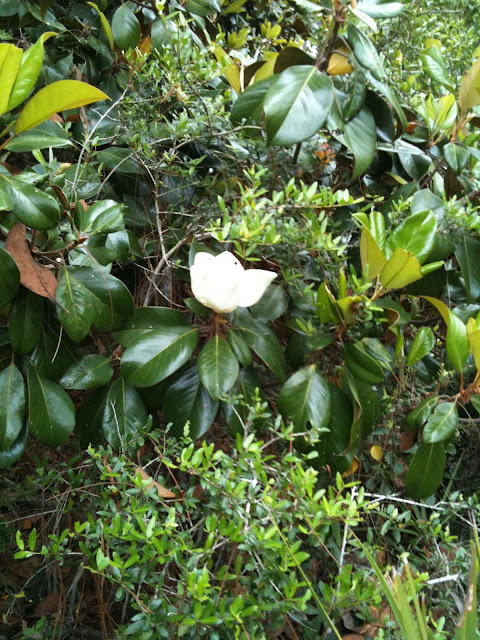 Magnolias are blooming here right now...so when I'm running in the neighborhood, I will pass a magnolia and enjoy the delightful fragrance...that awesome smell of "The South". 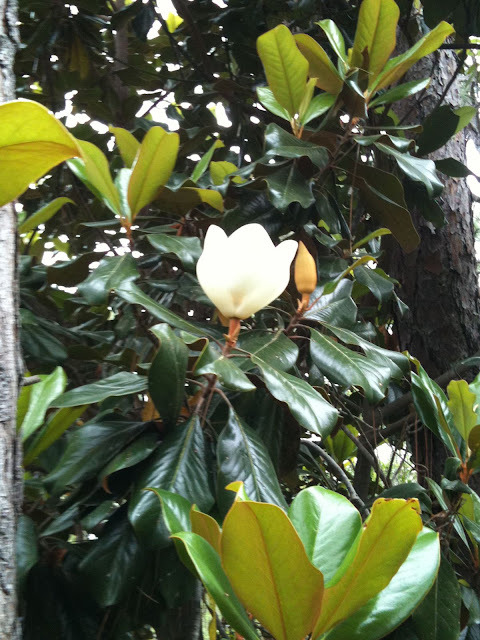 On a run this past week, I decided to snap a few pictures of a pretty magnolia flower. 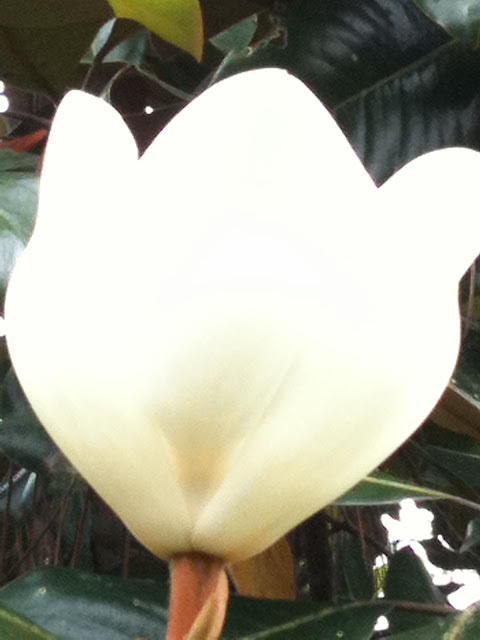 Any magnolia flower. Anyone? Anyone? Oddly enough, after my run during my cooldown, when I decided to pull my iPhone from the sleeve and get the camera ready, I couldn't find any easily-accessible magnolia flowers on the couple of blocks near my house. I saw several in the distance in peoples' backyards (I don't walk through peoples' yards to get photos), or else deep in the woods. So I gave in -- I went traipsing through a wooded lot towards a HUGE tree in full bloom. 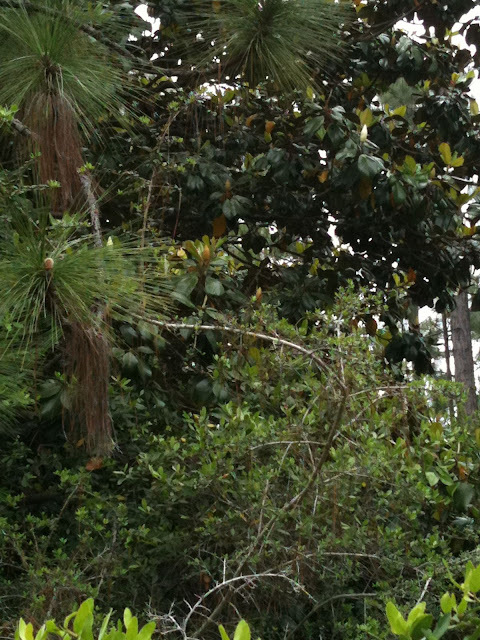 You can see the tree in the first picture, with the large oval dark glossy leaves. It smelled wonderful! I was wearing shorts and a tank top walking through this thick brush. My skin wasn't happy with me after this little adventure. This flower is about the size of my fist. And it smelled SO GOOD! For the first time, this week I got up close and personal with these flowers and was impressed with the detail in the blooms! We have white, pink and fuschia flowers. Who here has read the book "White Oleander" by Janet Fitch? I remember reading it when it was an "Oprah's Book Club" selection. Who remember's Oprah's Book Club? Ha ha! Loving the ragged-edged inner petals! Loquats, anyone? This was in full production on the edge of a house's yard that I run past at least once a week. Thanks to a couple of Facebook friends who helped me verify what these are. Gardenia! This is in my front yard -- I cannot WAIT for it to open! I'll be out there as soon as it does -- with our good camera! Mother's Day 2011...Or "What Your Kids Really Think About You"
Hopefully the Moms reading this had a nice Mother's Day. I enjoyed a nice day with my boys. I've cracked the code for happy kids: a trip to the beach! They were happy, I was happy watching (and catching a few waves with a Boogie Board! ), all was well with the world. The boys each brought home really cute Mother's Day gifts from school on Friday. 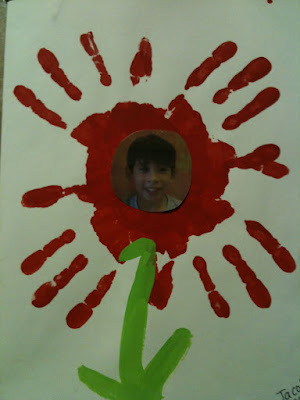 I'm such a sucker for handprint art from my kids! 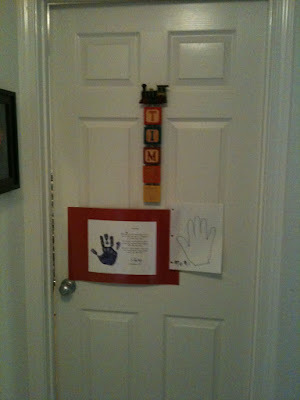 Timmy asked me to turn his Mother's Day card to me into a Handprint Identification Panel for his room. So that only he could enter/exit, and not his brother. Okay, why not? What else was I going to do with a Mother's Day gift from my son? Each boy also brought home these question and answer sheets. They filled in the blanks answering questions about Mom. I won't show the whole thing -- since it has things like my age and my favorite colors. You guys don't need to know all that. But here's a sliver of each boys' assignment, which is a glimpse into what they think about me. An excerpt from Jacob's assignment. The first question and answer absolutely melted my heart. The second one...well...I guess it's a sign that perhaps I need to get off the grid a little more often. From Timmy's assignment. If you can't quite decipher it, it reads "She likes to clean and shop." I guess I'm glad Timmy thinks I like to clean. Not sure I want him thinking I don't like cleaning...even though I don't care for cleaning that much. A necessary evil. The other questions and answers were all very nice. Jacob's answer certainly has me assessing the laptop fused to my lap, and whether it's time to back off a little. I think so. 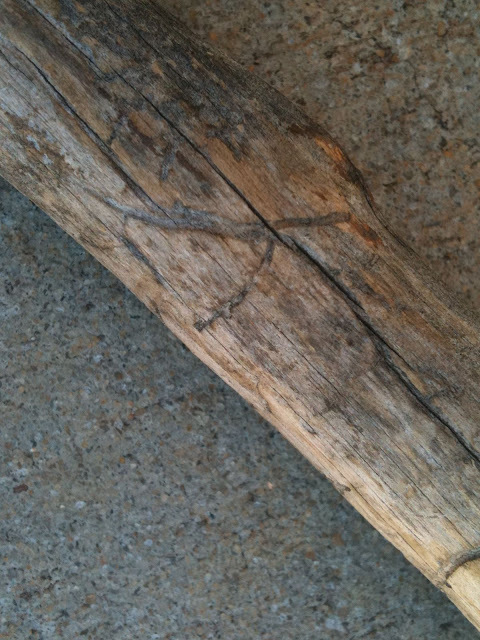 When we were in South Dakota last May, the boys picked up branches to use as hiking sticks. There was ponderosa pine all over the place, and it wasn't hard for the boys to find something in their sizes. 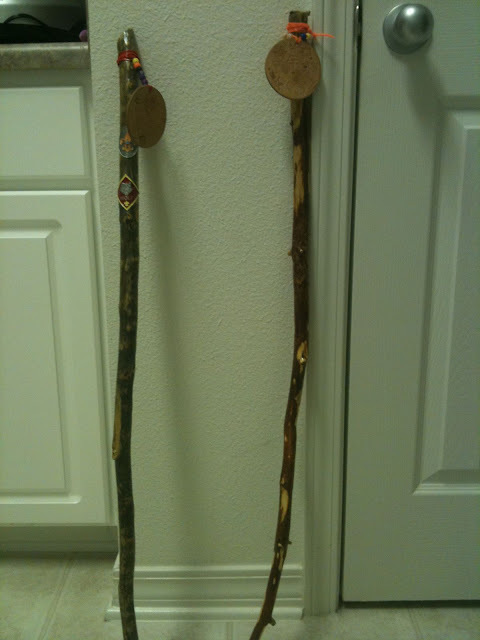 The boys begged to bring home the sticks as "souvenirs" from their trip. 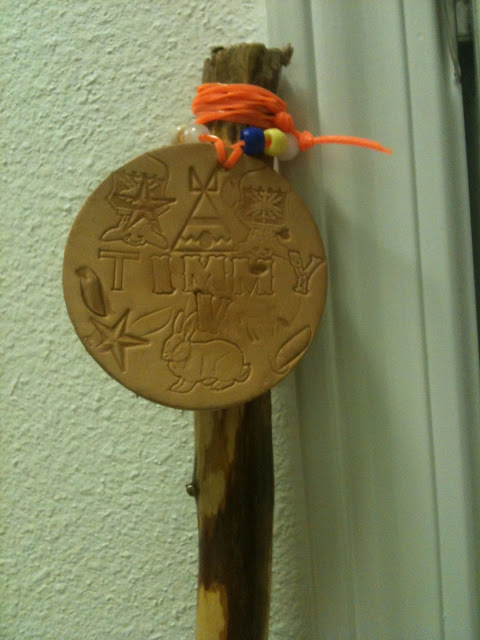 How could I say "No" to such a cute idea for a souvenir??? Dave and I had promised for months to "finish" the sticks and make them more permanent: sand them down and coat them with some polyurethane. We even took the sticks with us to Colorado last August for hiking at Rocky Mountain National Park! 11 1/2 months later, I finally finished this project. A camping trip to the Green Mountains next month inspired me to get this done. It was only the cost of the polyurethane and sandpaper. I fear they might outgrow these pretty quickly though. YES, we moved the sticks from Nebraska to here. 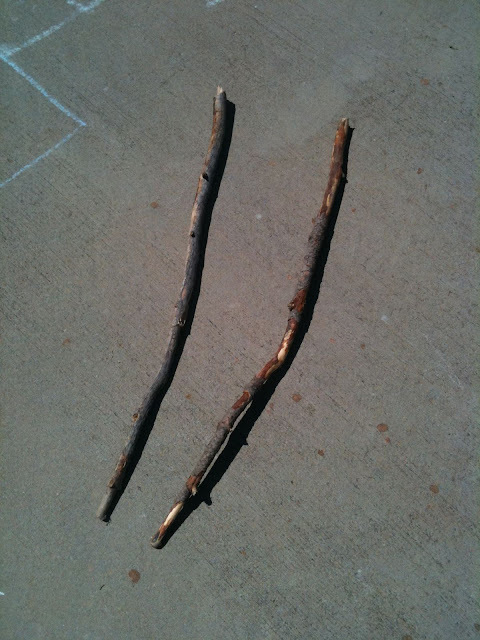 The sticks last week as I retrieved them from the umbrella bin where they'd been stored since we moved here. I used some 220 grit sandpaper to sand it all down. 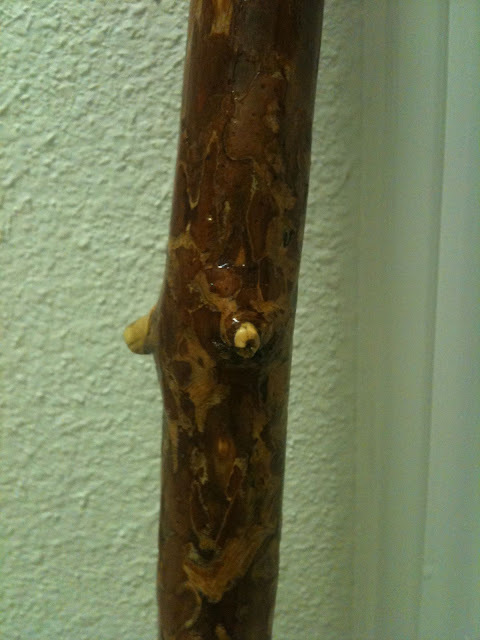 I had to break out a Gerber tool to whittle off the remaining bark. I then used a foam brush to apply 4 coats of Minwax polyurethane. The finished products. Complete with Scouting medallions on J's, and leather tags on both J's and T's. I'll add on some pictures of the boys with these later this week. I finished this after their bedtime tonight, and I don't have my good camera (still with Dave on his railfanning trip). Stay tuned! You can say I tried. 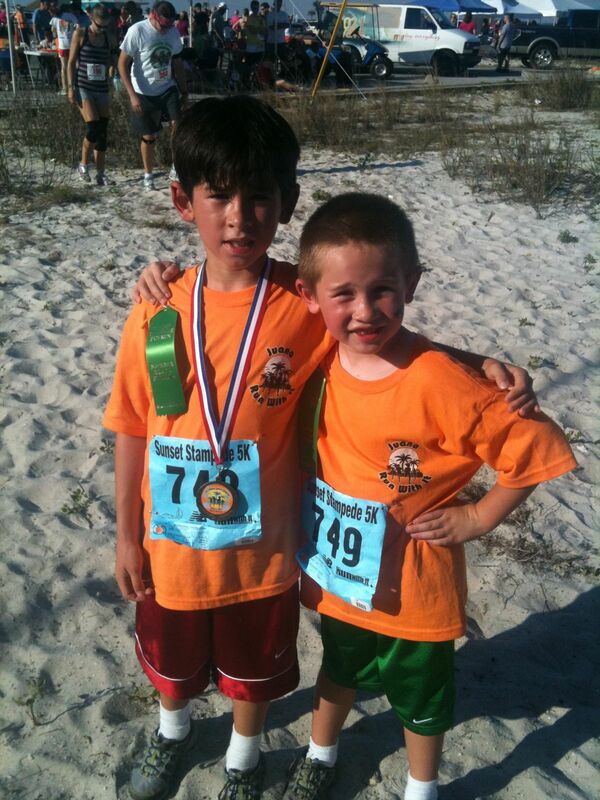 I think Jacob might have a future in long distance running...Timmy probably won't. 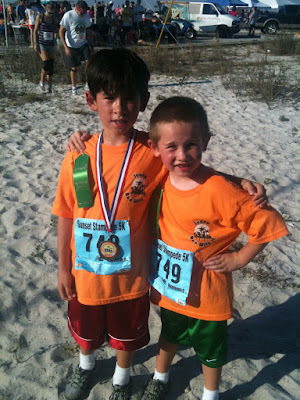 At a Mother's Day function this past week, one of Timmy's classmates' Moms tipped me off to a 1-mile kids' fun run in Navarre Beach last Saturday. 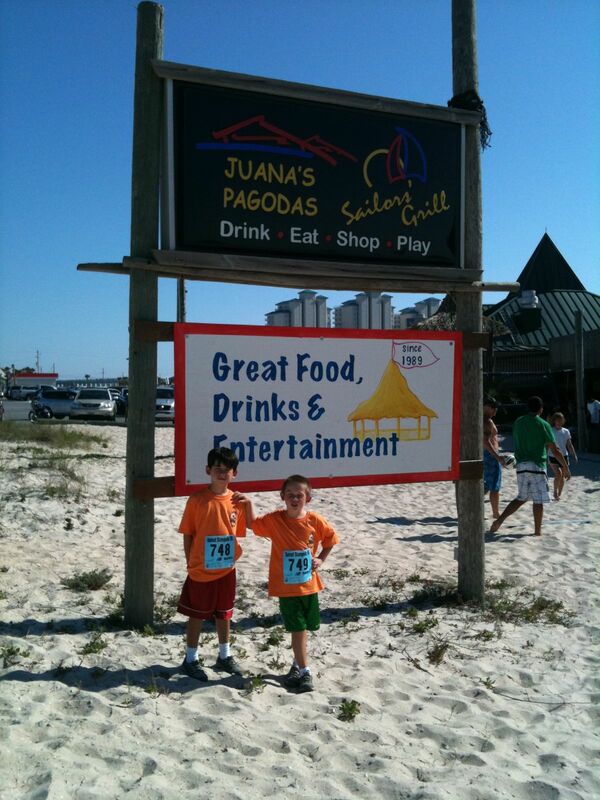 That night I headed over to one of our local hangouts in Navarre Beach, Juana's Pagoda, for the registration. The owner of Run With It, a local running store, was taking the registrations and I was flattered that he remembered me from when I visited his store a couple months ago. It was very cute how the kids received t-shirts and runners numbers. The boys and I stayed for dinner Friday night and enjoyed the volleyball area and beach area. On Saturday I took the kids over to the race. Jacob was quite excited, but Timmy? Not so much. Jacob met an 8-year-old girl who was getting ready to run the 5K with her Mom and Jacob seemed interested in that, but perhaps we need a little training first. The run was very hot. Jacob charged ahead and ran it with all his energy and did quite well. I had to give Jacob some instructions about what to do if he needed help during the run ("tell an adult helper that your Mom is wearing a green t-shirt"). On the other hand, Timmy wanted to hold my hand the whole time and ended up pretty frustrated. Timmy clearly doesn't like running the way Jacob does! 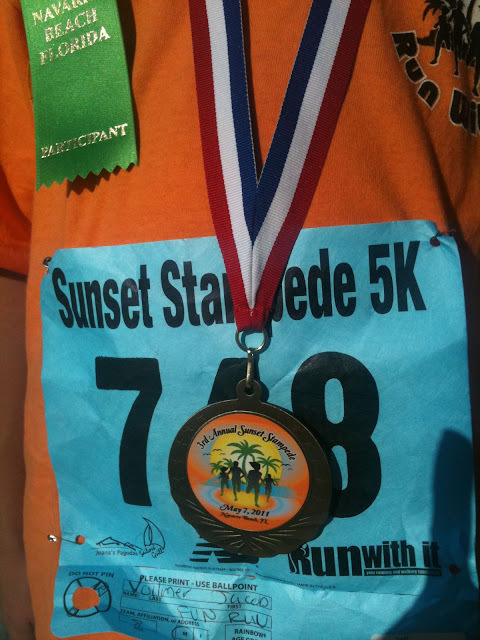 The medal is really really nice (considering it was for a 1-mile fun-run)! 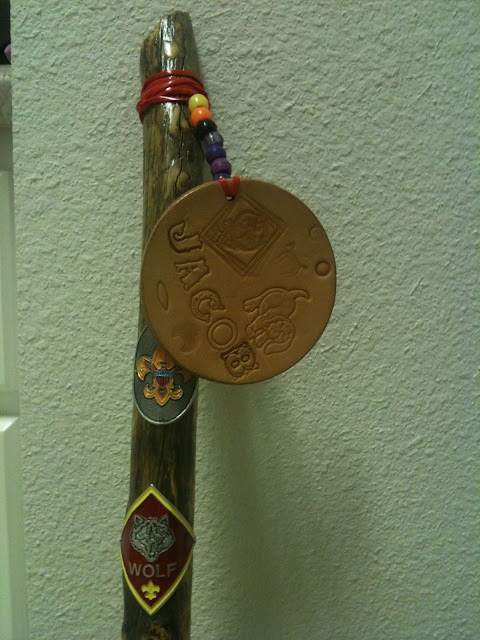 Jacob is incredibly proud, as am I! Last night the boys asked to make homemade salsa. We were coming home from a fun run last evening and I told the boys we could stop at Publix to pick up the things we need. I whipped out my iPhone ("Pardon me while I whip this out....") and Googled a salsa recipe. I don't know how she does it, but Pioneer Woman's salsa recipes topped by Google search results. I chose the "Restaurant Style Salsa". We have fresh jalapenos and cilantro in my garden (YUM! ), and a big fat Vidalia onion and some garlic in my veggie drawer, so I picked up the other items I needed. I didn't take step-by-step instruction photos since PW takes care of that for us, but here's our end product! The boys were devouring it as soon as I opened the food processor lid. That's Timmy's hand dipping in a chip to taste. This recipe makes a TON of the salsa (that's a 12-cup food processor there that's 3/4 full) -- I'm inclined to put some in jars and run it through the canner. I'd put this salsa up against anything we've had in Mexican restaurants! It's pretty tasty, the kids enjoyed it (hooray for veggies! ), and by some miracle after eating about 1/2 cup of the stuff with last night's dinner, I didn't get heartburn! Whoo hoo!